This October holds a special place in our heart as the majority of children in our program have been impacted by Breast Cancer. Throughout the month we will be sending out stories about the triumphs of those kids who have seen the traumatic effects of Breast Cancer and now, because of Walk With Sally, they are making an impact on our community. Thank you to Chevron for helping us to tell these stories. More than 130 Walk With Sally mentors, mentees and family members gathered together for our 5th Annual Surf Day Friendship Activity in Manhattan Beach, CA. Together with the Jimmy Miller Memorial Foundation and support from Camp Surf, Babalu Iron Gym, Hang Ten Sunglasses for Kids, and Jimmy John’s, we spent the day on the sand and in the water. Our mentees were truly expanding their horizons that day as many of them were going in the ocean for the first time, or meeting new friends who are also dealing with the impact of cancer. One of those kids at Surf Day was Isaac, a 10 year old 5th grader whose mom is battling stage 2 breast cancer. Isaac looks at Walk With Sally as a family “because we have all been touched by the same thing.” Thanks to you, this family of support is possible for kids like Isaac! One Hour Long Cycle Returns October 20th! Are you doing anything to honor a loved one who was touched by Breast Cancer this month? Join us on Saturday, October 20th at 11a.m. PDT to lift a kettlebell for the 9th Annual One Hour Long Cycle. Take the challenge to see how many reps you can do and how many friendships you can create with this international fitness event. If you’re local to Southern California, join us at Afterburn Fitness in Manhattan Beach, or check out the website to find another location near you! One key success factor that leads to our mentorships lasting longer than the national average, is the support from the Walk With Sally community at events like Heart to Home. 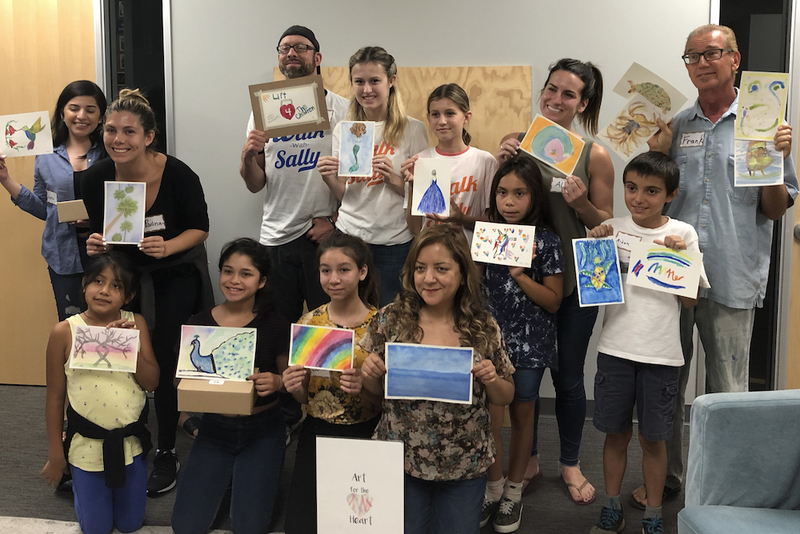 This month for our art healing session we were thrilled to partner with Art For The Heart, another nonprofit partner whose mission is to foster health through creativity, to create unique watercolor paintings. Thus far through 3 of 4 sessions we have welcomed 58 participants and are looking forward to our next session of jewelry making with Kendra Scott. For The Kids Social Club wants to make an impact this October for Breast Cancer Awareness month with their fundraising event at Kendra Scott. Join our crew of philanthropic young professionals on Friday, October 12th at the Kendra Scott store at The Point in El Segundo and browse their newest season of bling. A portion of proceeds from every purchase that night will benefit Walk With Sally! For families in our mentoring program, the holidays can often be a difficult and stressful time. Walk With Sally offers hope by finding individuals/ companies/ organizations willing to purchase a few wish-list items that can make the holiday season a little more cheerful! If you’re interested in playing Santa and adopting a family this year, please sign up here to get more details. You can make a difference this October by investing in children who are dealing with the impact of breast cancer. Honor a loved one and take a stand against breast cancer. This entry was posted in Happenings and tagged 2018, Breast Cancer, Breast Friends, Chevron, event, friendship activity, FTK Social Club, Heart to Home, Kendra Scott, Newsletter, October, One Hour Long CYcle, Surf Day.